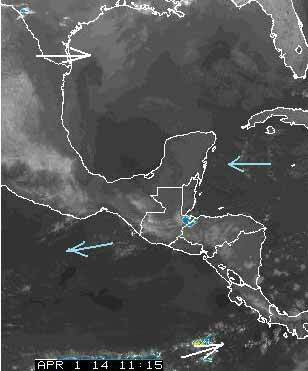 Belize NMS: Warm and mostly dry conditions prevail. 24-hour forecast: Partly cloudy tonight and mostly sunny tomorrow. Showers, if any, will be brief and isolated. Winds: East at 5-15 knots. Today: Winds: East 5-15 kts. Seas: Choppy. Waves: 2-3 ft. Little or no rain. Tomorrow: Winds: East 10-20 kts. Seas: Choppy moderate. Waves:3-5 ft. Chance of only isolated showers. Marine Outlook: Winds: East 10-20 kts. Seas: Choppy moderate. Waves:3-5 ft. Chance of only isolated showers. General Outlook: (Wed & Wed night) Similar weather conditions. On Ambergris Caye this morning the weather is just awful, one of those days you just want to stay inside close to the fireplace and read a book. Significant showers to the south of Belize, a few minor showers south of Orange Walk, otherwise nothing. They have all cleared away now.. . . .Another hot day.